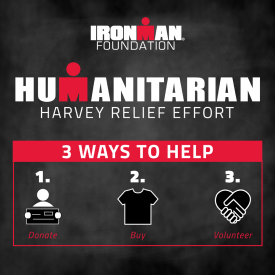 TAMPA, Fla. (August 30, 2017) – The IRONMAN Foundation® has launched a Harvey Relief Effort campaign to raise critical funds in response to the catastrophic and ongoing severe weather and flooding in Texas. Funds raised will support recovery efforts and service projects in the greater race communities for the Memorial Hermann IRONMAN® North American Championship Texas, Memorial Hermann IRONMAN® 70.3® Texas and Humana Rock ‘n’ Roll San Antonio Marathon & ½ Marathon®. With record floodwaters devastating much of southeast Texas, tens of thousands of people will seek emergency shelter and more than 450,000 will seek federal aid in recovering from Harvey. When the Category 4 hurricane made landfall, it was the most powerful to hit the United States in a decade. Officials have called the catastrophic flooding the worst in the state’s history. Thousands have been rescued from flooded homes and cars and recovery will take years. DONATE – The IRONMAN Foundation will match all donations made by September 30, 2017, up to $10,000. T-SHIRT SALES – 100% of the proceeds raised through the sale of a custom Humanitarian Harvey Relief T-Shirt will go towards the IRONMAN Foundation’s Harvey Relief Efforts. VOLUNTEER – The IRONMAN Foundation will be setting up local service projects during race week at the Humana Rock ‘n’ Roll San Antonio Marathon & ½ Marathon, Memorial Hermann IRONMAN 70.3 Texas triathlon, and Memorial Hermann IRONMAN North American Championship Texas triathlon to provide hands-on rebuilding assistance. Pledges and t-shirt purchases may be made online or at all IRONMAN, IRONMAN 70.3 and Rock ‘n’ Roll Marathon Series event merchandise stores during September.